I am a very lucky kitteh. Yes, you read that right. I may hiss and growl when I feel one of the peeps—usually TW—doesn’t measure up to my high standards but I’m lucky. My peeps understand cats. They understand those little extras that make me a well-adjusted and happy cat. They know that I need more than food and vet visits to keep me healthy and happy. Hill’s® Science Diet® also understands. 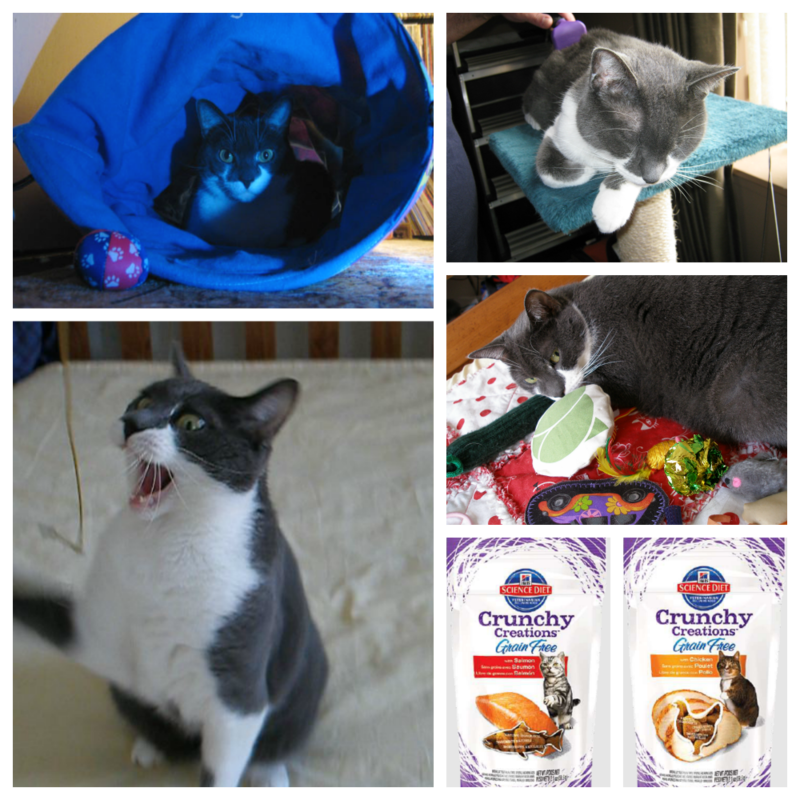 What more could I—and you my cat furrends—need beside healthy stinky goodness? I’m glad you axed. Let me give you the 411 about how this little ghetto kitteh rolls. Well, ♬♩I get up every morning. and I go to work at nine. And I come back home at five-thirty / get the same train every time. ♬ CUT! WRONG SONG! I am a well-respected cat though. Where was I? Sometime between five and six a.m., I jump outta bed and head to the window for some early Bird-tv and sun puddles. TW will get up so we can walk in the kitchen together. I then get an ounce and a half of stinky goodness to tide me over until my lunch. What do I hear? Pop is getting up! I know what that means. Almost every morning before Pop washes and shaves, he FURminates me and we bond. Bonding with Pop is my favorite time of day. I let my fur down and purr like crazy. My Pop ain’t no fool. He knows grooming is a way to show a little extra love to me. After he leaves, I lay down again to formulate the next blog post in my head. When TW finally gets up, I start dictating to her. After a lunch of grain-free gut rot food with pumpkin soup, I’m ready to play. Some days I’ll just take off running with TW right behind me. She’ll catch up eventually but I’ll keep running. These zoomies back and forth through our tiny condo will continue for awhile until I go up to my tunnel and TW gets tired of waiting for me to running through it. Other days I’ll just sit on my tissue paper. These days I expect TW to make up a game using the tissue paper and a peacock feather. Often she’ll get out the little DIY toy she made by tying a 39¢ hair accessory feather to an elastic string and put me through my paces jumping and stretching. Play and exercise are more little extras TW does to keep me healthy and my mind sharp. Every night I get my treats. Unfortunately for me she counts them out to make sure I don’t get fat. Hill’s has salmon and chicken treats that feature balanced nutrition but that doesn’t stop TW from counting the ways she loves me. After Pop goes to bed, TW and I have another play session usually involving the elusive red dot. I love these play sessions after the light goes out and the red dot runs across the floor. Occasionally, she’ll be tired and think she’s gonna turn in early but I usually have different ideas. Those nights, I’ll sing the song of my people loudly and proudly while batting my green ball with the rattle outside her bedroom. Grooming, toys, exercise and treats help me to stay happy and healthy. The moment you’ve all been waiting for. I’ll be giving away two treat bundles of the winners’ choice. The dog bundle includes a stainless steel dog bowl, a bag of Hill’s Science Diet Dental Chews, a bag of Hill’s Science Diet dog treats and a Healthier Pets, Happier Lives tote bag. 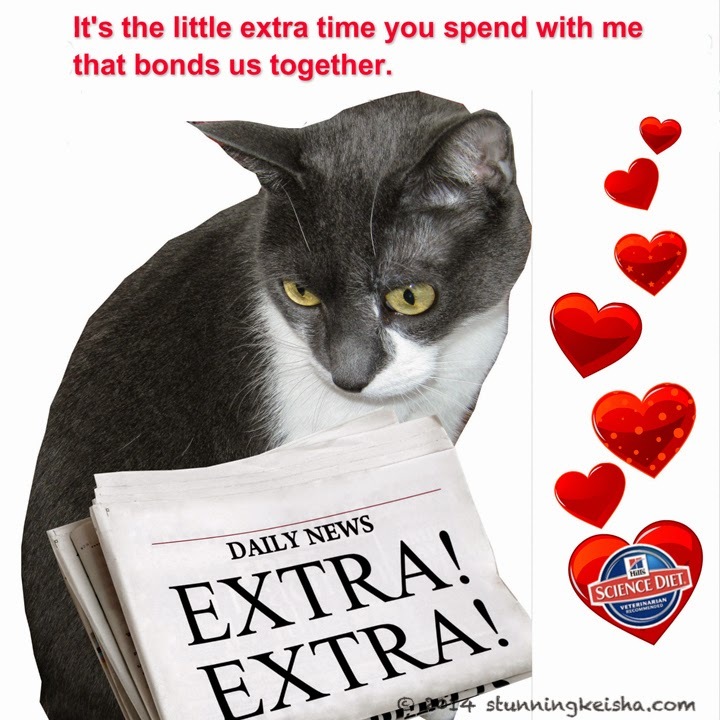 The little extras bundle for cats includes a laser pointer toy, a stainless steel cat bowl, eight micro cans of Hill’s Science Diet Grain Free entrees, and a Healthier Pets, Happier Lives tote bag. Thanks to Hill’s for hosting this giveaway. Contest rules: Use the Rafflecopter to enter. There are two mandatory options and two just for fun. Winners must be U.S. residents; those from across the pond can enter for a U.S. friend or shelter. The giveaway ends on September 30th at 12 a.m. EST. No purchase is necessary. Good luck! This is your lucky day! There's still time to enter to win $100 toward your pet's next vet checkup. One winner every day through Sept. 30! Hill’s is also offering a $10 off promotion on select Hill’s Science Diet products. Check out www.ScienceDiet.com/GetHealthyHappy to enter the contest or download your rebate today! Remember, don’t just get happy. #GetHealthyHappy with Hill’s ScienceDiet. We pester the peeps for all those things too...guess it's NICE to be spoiled. We sure are lucky cat´s arn´t we CK ! It's a good life, isn't it, CK? It sounds like not giving you unlimited treats is one of the ways TW shows you she loves you. Humans are funny that way, aren't they? It's a hard life CK, a hard life, specially when they count the treats. Have a marvellous Monday. Being loved and spoiled sure has lots of advantages CK! We are the lucky ones, aren't we CK? You are a very well loved kitty CK. I can tell. Wow CK, that is a busy schedule for you! Sounds like you have a great time with your peeps. They sure do come up with some pretty creative ways to play with you. Sounds like you get lots of quality time and playing with your people CK. I like playing with my mum and dad too, and I like it when I take them for walks in the fields. I am getting lots of extra treats too. Mum puts my antibiotics in them mornings and night times. She thinks I don't know but it means 4 treats and only 1 has a pill in. I don't think I am the silly one do you. Great giveaway! Good luck to everyone who enters! Gee, dog or cat. I have five Treeing Walker Coonhounds and three cats (all rescues). Two of the cats just had birthdays and are taken care of. Two of the dogs have birthdays next month, so I guess I'd pick the dog package if I win. 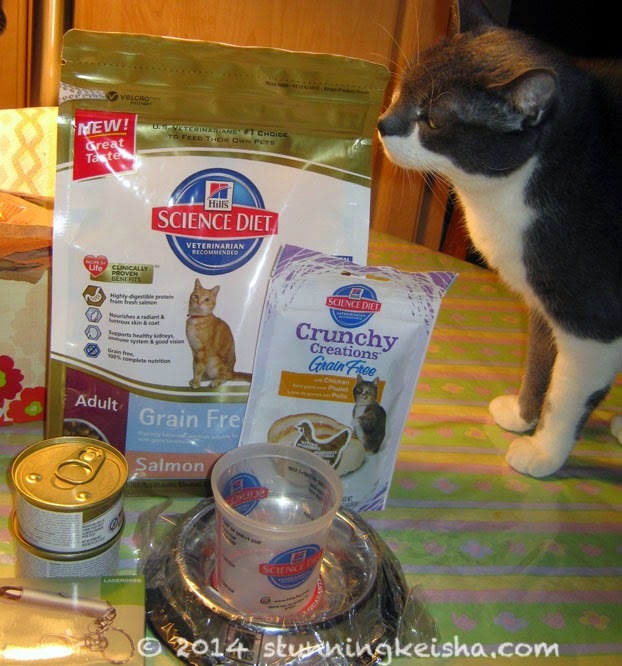 As you know, we are big fans of Science Diet food here. i'm still on their diet food, so won't participate in your giveaway. A cat has to do what a cat has to do! Thanks for stopping by and helping me celebrate my Blogoversary yesterday. Always fun to see and visit with you. Wow Ck yous hav a gweat day. Weez do luv ow alone time wiff mommy. And dat be a cool giv away. Wow CK, you certainly know how to keep the peeps busy! Our kitties would love that pawrize if we win! Oh that dreaded red dot. But if it helps you exercise, that's fantastic. Ohh you have a great routine CK! I have to share with everyone so there isn't as much individual play as I would like but we all love our science diet treats! Ralphie and I get to vote so we would like to be entered to win a kitty prize! We are glad your peeps spend lots of time with you, CK. What a PAWSOME give away. And we get a similar routine here to CK. Lots of loving and play and super healthy stinky goodness and treats. You're a daddy's girl, CK! Gloman and I have our special time every morning too. Sounds like you have a great life! I wish all cats were so lucky...It breaks my heart to think of all the homeless cats. Your life sounds like it's wonderful, CK! We have it good here, too. Lucky cats, indeed! CK that's a pretty darn good schedule you have there at your house.....also sounds like you have your humans well trained which of course is impawtant. We entered the giveaway as I've never had Hills and it sounds like it just might be up my alley (or up my driveway?). Excellent job training your peeps, CK. It would be nice to win the cat bundle, thanks for hosting this give away. I'd like to win a cat bundle (or a dog bundle). We ARE catching up CK!! Sorry to take so long to get to this. I know I have pals in the USA I would LOVE to win this for!! I would like the dog bundle. Thanks! My Scout enjoys those red laser dot toys too! What fun!